Six days to the presidential election, which holds this weekend, some of the hitherto fluid extrapolations have finally paved the way for more distinct pictures on the state of play in the race for the nationâ€™s crucial first round of elections. 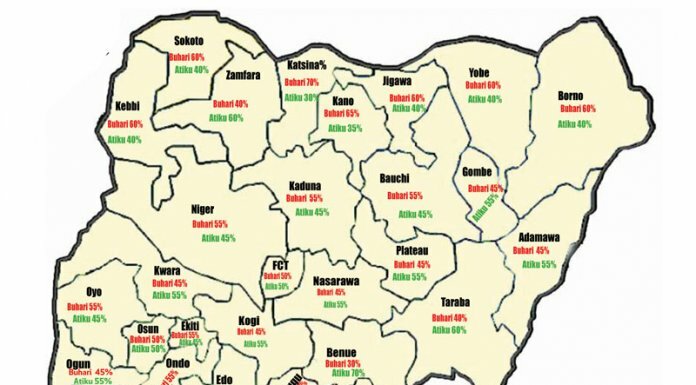 From the state-by-state analysis of last Sunday, the week that just ended has seen both leading candidates of the two major parties â€“ Atiku Abubakar of the Peoples Democratic Party (PDP) and Muhammadu Buhari of All Progressives Congress (APC) shift in their former positions in certain areas, based also on certain conditions. THISDAYâ€™s continuous fieldwork, which last week reported a tight and tough contest between the two candidates, has shifted considerations in many of the states, since both men have also improved in their current standings, with higher percentages from where they earlier stood last week and shot down in the others. The Katsina equation has though not changed. The reality is that Katsina is split between the Katsina and the Daura Emirates. The Katsina Emirate has the numbers over and above Daura. No doubt, Buhari would take Daura, but Katsina would go the way of PDP, because it is the home of the Yarâ€™Aduaâ€™s PDM, of which Atiku is a critical part. There is also the Ibrahim Shema influence, which cannot be dismissed. Thus, Katsina would still be 70 per cent for Buhari and 30 per cent for Atiku. The Sokoto race too promises a decent fight. Buhari and Atiku would part with 60 and 40 per cent respectively in favour of Buhari. Certain recent developments in the state like the resignation of some commissioners counted against the PDP. But the equation in Zamfara has changed. Here the contest promises to give Atiku 60 per cent and Buhari 40 per cent. Kebbi still looks comfortable for Buhari with a 60 per cent advantage over Atikuâ€™s 40 per cent. The same ratio is applicable in Jigawa, despite the Sule Lamido factor. The battle for North East too has changed. In Bauchi, for example, Buhari is now reduced to 55 per cent, comparatively to Atikuâ€™s 45, while in Borno Buhari still maintains his 60 to Atikuâ€™s 40 per cent. The Adamawa gap too has reduced. Here, Atiku now boasts 55 per cent leaving Buhari with 45 per cent. In Yobe, Buhari is still good with his 60 per cent and Atiku 40 per cent. The Gombe ratio too has shrunk. Atiku now has 55 per cent and Buhari 45 per cent. The Taraba score has also shot down. Atiku now has 60 per cent to Buhariâ€™s 40 per cent. Staying the same is Kogi State, which still looks good for Atiku with 55/45 sharing formula. The Niger equation too remains the same: Buhari with 55 per cent and Atiku 45 per cent. Kwara is still giving Atiku 55 per cent to Buhariâ€™s 45 per cent. In Ekiti, Atiku has slightly closed in with 45 per cent while Buhari still wins with 55. The same equation is retained in Ogun albeit in favour of Atiku with 55 per cent to Buhariâ€™s 45 per cent. The political situation in the state has not changed much. Nonetheless, Lagos is still a 50-50 per cent ratio. The South-east has remained immovable and so is its resolve. Imo is still rooting for Atiku with at least 60 per cent to Buhariâ€™s 40 per cent. Abia too is still 60-40 in favour of Atiku. Ebonyi is not changing her 60-40 ratio in favour of Atiku, while Enugu has gone a notch up for the PDP with 80 per cent for Atiku and 20 per cent for Buhari. A recent court judgment, which sacked the APC candidate, Senator Ayogu Eze, did not help the party. The South-south too is resolute in its stand for the PDP. Rivers is not changing the 80 to 20 per cent ratio in favour of Atiku. Cross River is still solidly 70 per cent for Atiku and 30 per cent for Buhari. Akwa Ibom, despite the current challenges, has marked up and itâ€™s delivering PDP with 70 per cent to Buhariâ€™s 30 per cent. Edo still maintains 55 per cent for Atiku and 45 for Buhari. The APC recorded some gain in Delta and posted 30 per cent for Buhari to PDPâ€™s 70 per cent for Atiku. In Bayelsa, the APC struggled to improve its standing to 30 per cent, while Atiku will still make do with 70 per cent. Itâ€™s still a balance of 50/50 for Buhari and Atiku at the Federal Capital Territory (FCT). The FCT is up for grab.